Parts are molded in light grey plastic that has a touch of brittleness, yet remaining flexible, reminiscent of what Hasegawa or Dragon produce. Personally I prefer this style of plastic over the soft plastic that has become more common these days, especially from the Eastern European manufacturers. Also included is a very nicely done and clear instruction sheet, a clear piece of acetate for the windshield plus a small sheet of decals. Detail is crisp. 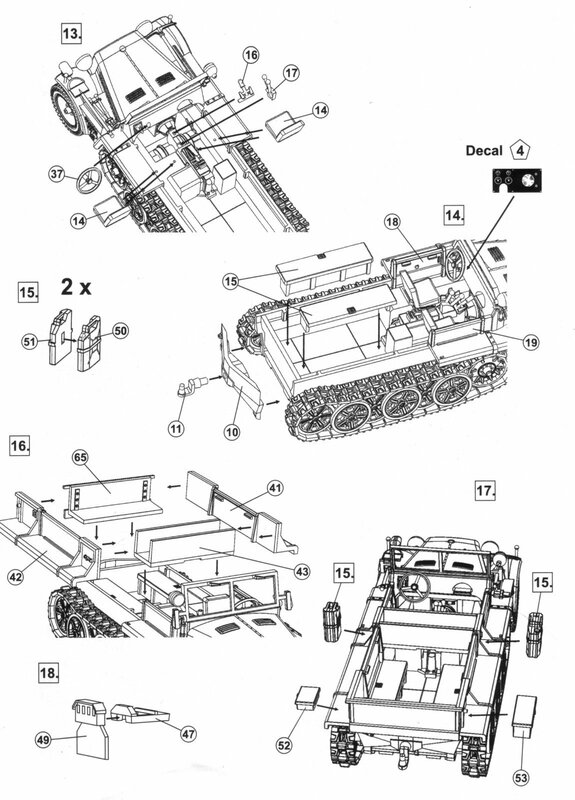 It would have been nice to have a sprue diagram showing the parts layout included with the instructions. All the parts come on a single tree which makes them rather tightly packed together. 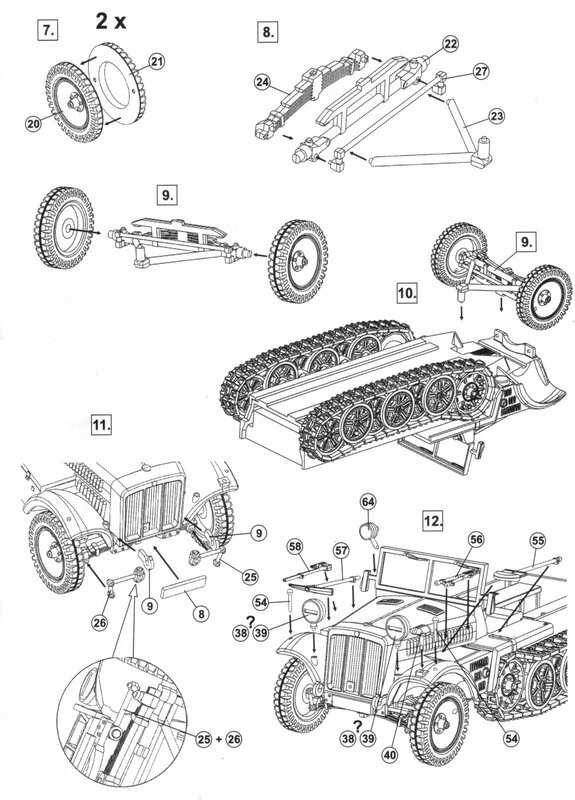 Take care in removing the parts so as to not bump and damage adjacent pieces. 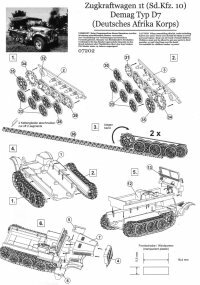 Parts 44, 59 & 60 are not used and I assume these are for their other Demag release for the European version (kit no. 07201). 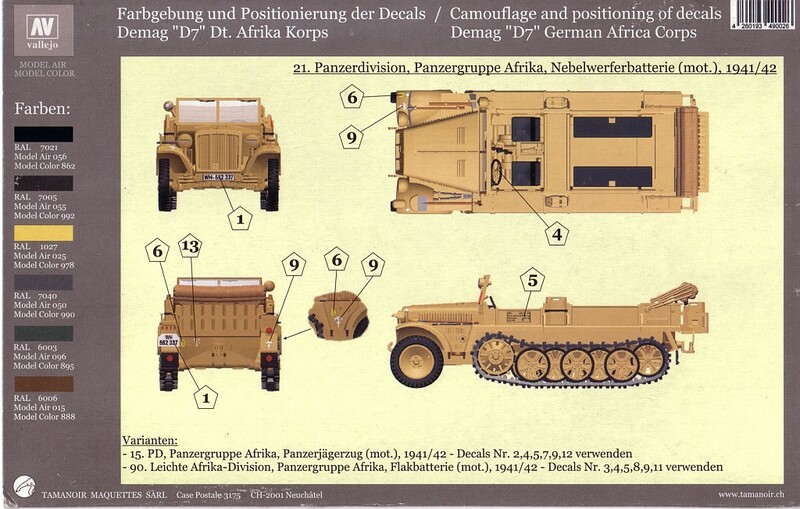 Plate number WH-552337, 21st Panzer Division, Panzergruppe Afrika, Nebelwerferbatterie (mot. ), 1941-1942. 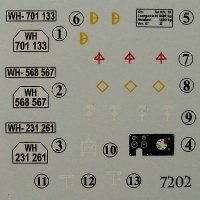 Plate number WH-568567, 15th Panzer Division, Panzergruppe Afrika, Panzerjägerzug (mot. ), 1941-1942. 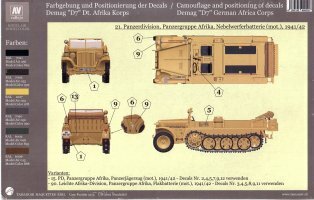 Plate number WH-231261, 90th Leichte Africa-Division, Panzergruppe Afrika, Flakbatterie (mot. ), 1941-1942. A nice touch is the inclusion of a decal for the dashboard instrument cluster, something all manufacturers should include when a kit has an open view of the driving position. The images are printed on very thin transfer film. The inks are opaque enough to prevent bleed through of the underlying camouflage. There was some register problems with the divisional emblems for the 21 PD and 90 Leichte Division. These are yellow with an underlying layer of white which unfortunately peeks around the edges in a few spots. This white outline made me decide to use the second marking option as the unit badge was just plain red. 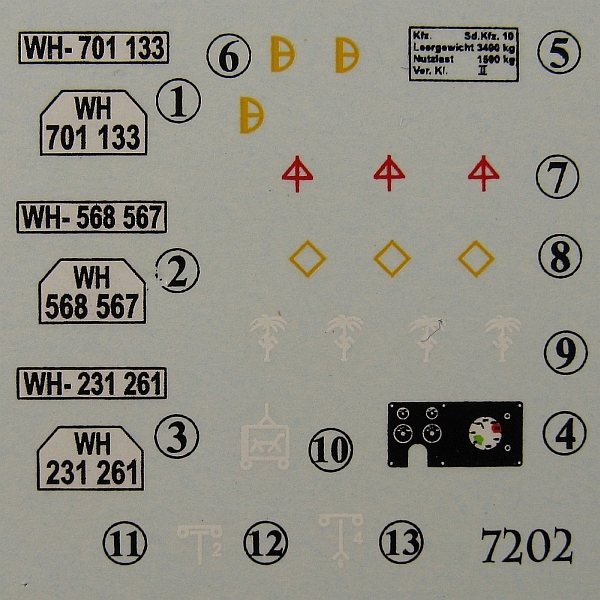 I was also confused somewhat by the decal sheet. For the first, second and third marking options the colouring guide states that images 13, 12 and 11 are to be used respectively. Well there wasn't a 11, just a 10, 12 & 13. Assuming that the 13 was correct for option one, I used decal 12 for option two. There is very little flash on the pieces but the majority of the parts do carry a small seam line. There is one particularly onerous one that runs down the side of the hood right through the molded on cooling louvres. Some care will be needed here to get rid of the line without destroying the louvre detail. To remove the seam I lightly ran the tip of an Xacto knife a few time between each of the louvres and then followed that with a light sanding with some fine grit paper folded knife thin. Next some light sanding along the the louvre edges removed the seam line there and lastly I quickly brushed some methylene chloride (MEK) over the louvres to melt any remaining seam. I use methylene chloride because it's aggressive action quickly dissolves the plastic yet it does not leave any melt marks in the plastic due to its quick evaporation rate. There are some ejector pin marks scattered about. 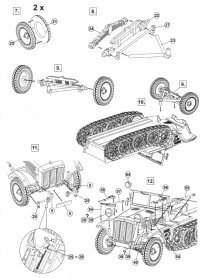 Though most are located in thoughtful spots where they can not be seen once they are on the kit, there are a few that are found in rather poor locations: on the underside of the chassis and on the outward facing portion of the front wheel rims. There are also a few sink marks, with the most significant one found on the dashboard face, which definitely needs to be filled. 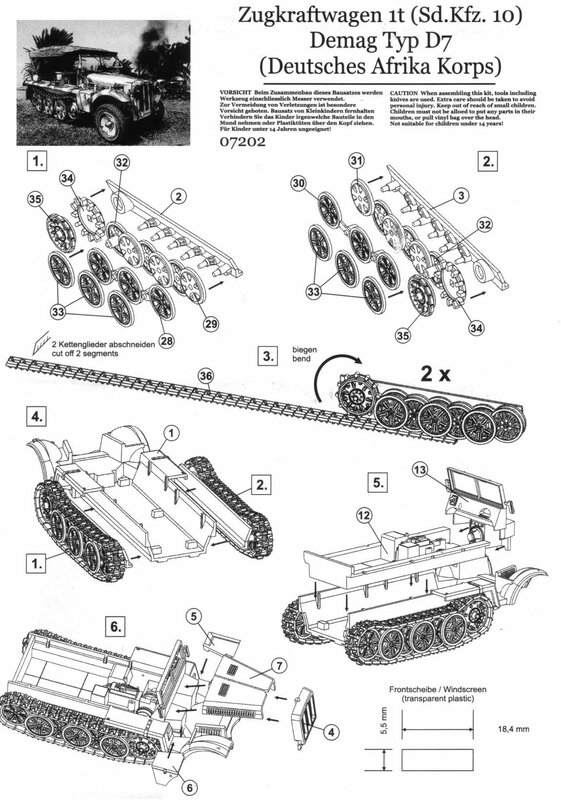 I figured that for ease of construction I would build the kit as three sub-assemblies: body, left and right track units. My original plan was to have the front suspension as a fourth sub-unit and add it following the painting, but on second thought I figured it would be safer to have it mounted to the vehicle to prevent any mishaps during the remainder of the build. 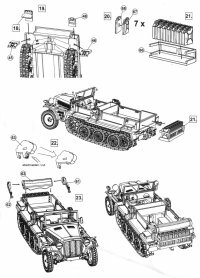 But then again, being uncertain that the model would sit level with the front suspension in place before the track units, I tested the sit by blue tacking the front wheels and bogie units to the body and then set the vehicle on its tracks. Everything looked good at the time, but I think something went amiss when I actually glued the suspension to the front of the chassis/body. I suspect that the front axle got pushed further down into its recess than when I had it jury rigged with the blue tack, because after I added the track units I discovered a slight gap between the wheels and the ground of slightly less than a 1mm. Ah well, live and learn, as they say! I really liked the one piece styrene tracks. They bend quite easily (just don't bend them too often or the plastic will fatigue and crack) and work much better than link-and-length style in my opinion. 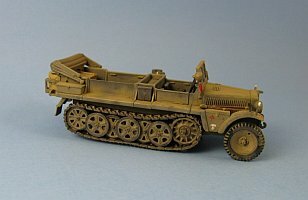 You just need to have room enough under the fenders and the body to get them around the wheels and with this kit having separate bogie units that can be attached at a later point in the construction process, this worked extremely easily. Instructions say to cut 2 links from the tracks. I did this for one side and found the ends just didn't quite meet as I would like them to, so on the other side I cut off just under two links (the cut running through the pad of the link) and the fit was much better. I hid the join at the back side of the idler wheel so it would be partly hidden by the rear mud guard. I also filled and sanded the join to make it less conspicuous. Another nice feature is the wheel units for the tracks. The back and middle portions are joined in a similar fashion to Dragon and Revell. Only the outer wheels are separate items. It would have been nice if MK72 had also chosen to vary the spoke positions from side to side though to prevent identical views of the track units. I found the fit of the first outer wheel directly to the rear of the drive sprocket would not sit parallel to the tracks. If you look close on my built model you will see a slight toe in to them. The 7 jerry cans for the rear rack won't all fit into the rack after painting. I had kept them separated so I could paint some grey and some tan and to add some white crosses indicating they contained water. I made sure they would all fit before painting by placing them loosely in the rack but the layer of paint on each was just enough to prevent the last can from fitting into the end of the rack. It wound up on the side with a strap made from thin lead foil wrapped around it. So if you're not too concerned with the colour of the cans it may be best to add them to the rack beforehand. 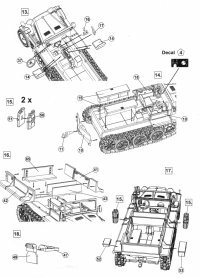 Also make sure this is done before you add the folded rear compartment cover (parts 61, 62 & 63). Also, all the jerry cans come as two piece units, so when they are glued together you get a can with two handles. This is nice except that a jerry can should have three handles. So I decided to add the missing handle to the middle of each can. For this I cut some very thin slices from a sheet of plastic and glued them between the kit's handles. A tedious task to say the least but one that is in my opinion absolutely necessary to make the cans look proper. There are three jerry cans (with molded on straps) for mounting on the sides of the body but you only need two. When you add part 5, you will find a gap between it and front of the left fender. This gap is supposed to be there so don't fill it in. The tarp only comes in a folded down position, even though the boxtop shows otherwise. Printed on the instructions is a template for the front windshield which is most helpful in cutting the acetate. All I did was superimpose one of the edges of the acetate sheet over the top line of the template, scored the plastic with my hobby knife along the other three lines, then removed the acetate sheet and cut out the windshield using the scored lines as a guide. MK72 has molded a recess into the rear of the frame to accept the windshield that makes this task much easier. Only some minor sanding was needed and the acetate pretty much snapped into place in the frame. All the dread I had for this task turned out to be totally unfounded! When building the body in Step 16, I'd suggest adding the parts in this order: part 41, then part 42, then part 65 and finally part 43. Add part 43 last because it will need some trimming to fit in between the side walls. If you do it before adding the walls you'll have fit problems. The boxes (parts 52 & 53) have some minor sink marks on the top of the lids that can be removed easily with a bit of sanding. The seats and passenger benches are rather plain so I scratched on some creases using the tip of my Xacto knife and then toned them down some with a coat of MEK. There is no shaft for the steering wheel and the steering wheel as supplied will not fit into its assigned hole in the dash because of interference with the adjacent molded on levers. I fashioned a shaft from some plastic rod. I found that the hood did not sit evenly between the fenders with the right side fractionally closer to the radiator than the left. This made adding the tow hook to the right side difficult until I thinned the hook with some sanding. I'm not sure about the tools and their mountings, especially the pick axe and hatchet. All the pictures I could find showed them mounted on raised scaffold like extensions on the right fender. I just left these as they came with the kit. Be very careful applying the decals, especially the DAK palms. They will fold over on themselves without any warning and once that happens you'll never get them separated and the decal will be useless. You only use three of the DAK palms and fortunately the sheet supplies four DAK palms. I ruined one, and had to live with the goof up on another (the one located on the right side storage box just behind the fender). After a few applications of Microsol, the decals sat down very well and exhibited absolutely no silvering. I modified the base kit somewhat. I missed a couple of ejector pin marks in the panel in the rear of the back compartment (part 65) that didn't reveal themselves until I'd started my weathering so I covered them over with a box taken from my spares. For something different I also added a small box to the right side in place of one of the kit's jerry cans and I added a rolled up tarp made from two part epoxy putty to fill the void in the storage box behind the front seats. This also hid a couple of seams inside the box that I was not able to completely remove due to the constricted space. Normally I'd replace the fender markers with some scratchbuilt items but in this case I used the kit's markers since my references showed them to be flat disks like those in the kit versus the ball found on a lot of other vehicles. The exhaust pipe outlet was drilled out (found on part 5) and the holes in the wheels were refined with a drill bit. As a final touch I added a small brass disk for the radiator cap, this coming from a set of leftover etched pieces of a depth charge set. As far as painting is concerned all decal options specify the same camouflage scheme. 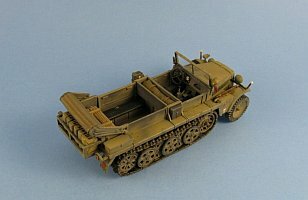 I varied a bit here in that I painted the interior of my model in Panzer Grey (Modelmaster 2094 enamel) versus the overall tan called for in the colouring guide. 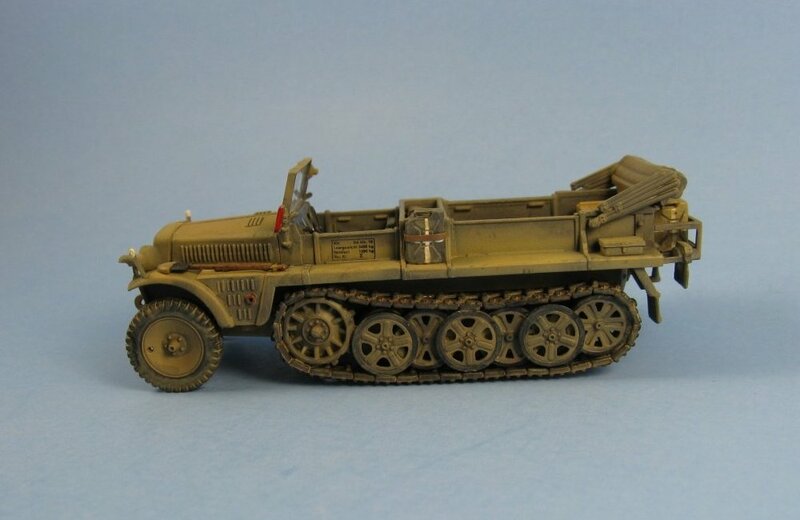 The exterior was done in a combination of Panzer Grey and Afrika Grunbraun (Modelmaster 2099 enamel. Tracks were painted black and, as I figured the dry African environment would not do much as far as rusting, I did practically none for this. Heavy weathering was mostly done with Afrika Dunkelgrau (Modelmaster 2103 enamel), my favourite colour for all my earth tone weathering. Overall I think this is an excellent first effort for a company with such little experience under its belt with injected plastic kits. With some more experience I feel that MK72 will be right up there with the “Big Boys”, like Dragon, Revell and Trumpeter in the not too distant future. All I hope that they continue down the path of offering kits of subjects that are slightly more on the esoteric side. 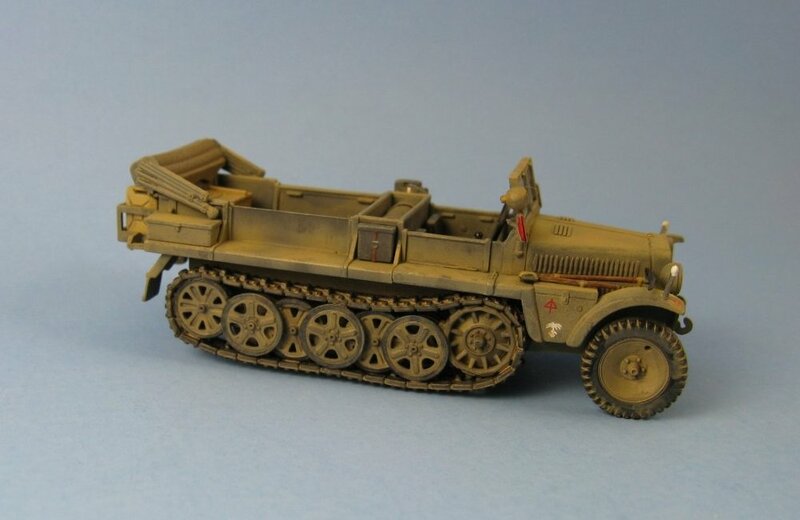 We could use some plastic injected kits of the Bren Carrier, some Allied Armoured Cars (hopefully they'll re-release their Humber Scout Car in injected plastic) and maybe some Japanese subjects (Please MK72, resist the urge to produce more Tigers, Panthers, Panzer IVs and Shermans!). For another look at the MK72 Demag, please check out Rob Haelterman's build of the sister kit, no. 07201, here. Review sample provided by MPK via Henk of Holland. 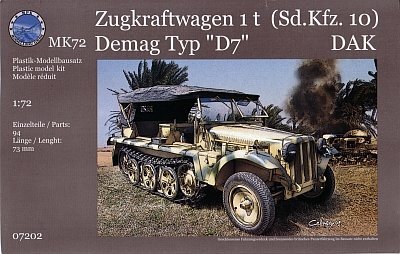 Demag-D7 Sd.Kfz.10 Walk Around on the Prime Portal website.